My brother died when I was 10 (he was 18). My parents told me one story of why he died, but I’m not sure I ever processed or believed it. A few years ago, I learned that his life was much more complicated than I imagined, that there were undercurrents and understories that gave a completely different spin on what he was going through. My parents (to my knowledge) never knew that stuff — they gravitated to the story that gave them comfort — something that fit their image and that their brains could accept. From what I’ve later learned, my brother may have been dealing with some form of depression — which we didn’t know as much about in 1970. Depression, and other forms of mental illness, have a significant impact on society (as we have seen far too often in today’s society). But it is something we’ve hesitated to talk about. Occasionally, a musical comes along that does attempt to open the dialogue. Quite a few years ago, the musical Next to Normal burst upon the scene, exploring the impact of bi-polar mental illness not only on the individual but on the family surrounding the individual. It was raw, real, and won the 2010 Pulitzer Prize for its efforts. A couple of years ago, another musical dealing with mental illness hit the boards of Broadway: Dear Evan Hansen. The North American Tour of the musical just hit the Ahmanson Theatre (FB) in Los Angeles, and last night we saw it — on the heals of the Thousand Oaks Shooting, and the deadly and destructive Camp, Hill, and Woolsey fires. Dear Evan Hansen (book by Steven Levenson; music and lyrics by Benj Pasek and Justin Paul) tells the story of (duh) Evan Hansen, a high school student with severe social anxiety, with a single mom who is working so hard to support her family that she has little time for her son. Evan’s therapist has assigned him the task of writing letters to himself to help deal with that anxiety. After a day when incidents at the first day of school make Evan feel transparent and unseen, he writes a letter to himself detailing his feelings. Connor Murphey, another loner student — who has also been dealing with depression and drugs — finds the letter on the printer. As it mentions Connor’s sister, Zoe, who Evan has a crush on, he teases Evan about the letter and takes it with him. When Connor commits suicide a few days later, his parents find the letter and believe it to be his suicide note. Grasping at straws, they believe Evan was the friend they never knew their son had, and draw him into their circle to learn more. With Evan’s anxiety, he can’t bring himself to correct them. With the help of his family friend, Jared, Evan builds a backstory of his friendship with Connor. This draws Evan even further into the sphere of the Murphy family, and ever closer to Zoe. A similarly unseen girl at school, Alana, similarly latches onto her “close acquaintance” with Connor, and soon there is a blog and a project dedicated to his memory, an effort to ensure that no one will be forgotten. End of Act I, and a good place to pause to explore the story to this point. When I discussed it with my wife at intermission, she was very bothered by the story, because it was all built on a lie — the fake premise that Evan actually was friends with Connor, and all the pain that could come from it when the house of cards collapsed. That bothered me as well, but I saw a lot more. First, as noted above, I saw the parallels to Next to Normal: the study of how someone’s mental illness impacted the family around him. In this case, it was how Connor’s depression and suicide drove the narrative of Connor’s family, destroying relationships. I saw how the desire to believe that their son was normal led that family to grab anything and ignore other facts. I also saw the message that likely resonated the most with the audience — the message drummed into the audience’s head as Act I reached its crescendo: NO ONE DESERVES TO BE FORGOTTEN, NO ONE DESERVES TO FADE AWAY. That fear of not being seen, of being invisible, of not making a difference is a powerful one. It is something that the audience ate up, permitting them to set aside the recognition of the lies that led to the message. But the problem with a house of cards is that the slightest windstorm will topple it. That windstorm occurs in Act II, as it must inevitably. By the end of the act, the message of not being forgotten that was beaten into your head in the first act has been replaced by something — in my opinion — that is more important from a mental health perspective: honesty. The key scene here is near the end of the act, when Evan is alone with his mother, admitting for the first time the truth about what had happened. His mom, similarly, shares the truth of what is happening with her. In doing so, we see the power of telling the truth about what is going on in our lives to those we love, and the importance of listening and being there through the hard times. Connor’s suicide was the result of his not being able to communicate his depression to those around him. Evan’s house of cards came from Evan not being able to admit to himself the truth. Healing came when the truth was admitted and heard. The first step on not being forgotten, on not facing away, is to be seen. The next step is to be heard. The third step is to be listened to. My wife left the show lukewarm to the story — the whole notion of lying and the construction of the house of cards really bothered her. It nagged at me, but I found the overall messages of the show to be quite powerful: the importance of not forgetting people, the importance of seeing people, the importance of listening to people, the importance of telling the truth of what is going on in your lives to those around you. I saw the message this show imparted about the damage that can be done to not only you, but to your friends and family, if you construct that house of cards to protect you. I saw the power of the love of a family to heal. The show gave me some insight on what my parents must have gone through when my brother died. It is quite likely they knew the true situation, but it was too painful for them, and so they constructed the house of cards of belief to get themselves true. Then, as we’ve seen from what is happening in Washington DC, if you tell a lie long enough it becomes the reality you remember and create, and it became the story that they told. I prefer the likely truth. But I’m an engineer. Under the direction of Michael Greif (who also directed Next to Normal and Rent), the show has powerful and raw performances. This isn’t your typical musical with large song and dance numbers (although there is choreography by Danny Mefford (FB)). Rather, it is mostly family situations, teen interactions, and exposure of raw nerves and emotions, especially in the second act. Leading the performance team is Ben Levi Ross as Evan Hansen (Stephen Christopher Anthony does the role on Wed, Thu, and Sat matinees, and Sun eve.). I found Ross’s performance powerful, capturing the social anxiety well. His collapse in the 2nd act is spectacular. He has a strong singing voice, and handles his numbers well. As his mother, Heidi Hansen, Jessica Phillips (FB) is somewhat lightly used in the first act, with a perfunctory single-mom role. But where she shines is in the 2nd act, particularly in the penultimate number “So Big/So Small” where every parent will recognize her raw emotion and feeling for her son. The Murphy family is represented by the catalyst for the story, Marrick Smith (FB) as Connor Murphy; Aaron Lazar (FB) and Christiane Noll (FB) as his parents Larry and Cynthia Murphy; and Maggie McKenna as his sister, Zoe. Smith’s role is small: you see him at the beginning as himself; later appearances are as a figment of Evan’s imagination. Still, in those numbers, Smith is still quite fun to watch. Lazar and Noll are strong as the Murphy parents. Lazar, in particular, was very strong in the “To Break In a Glove” number, and Noll was just great throughout. McKenna brought an interesting look to Zoe, and a delightful smile in her “Only Us” number in the 2nd act. McKenna had a great singing voice. All shone in the “Requiem” number. Rounding out the cast were Jared Goldsmith as Jared Kleinman, and Phoebe Koyabe as Alana Beck. Both were very strong, particularly in the “good for You” and the “Disappear” numbers. The “Community Voices”, who are heard in the “Disappear” number, are: Becca Ayers, Mary Bacon, Gerard Canonico, Jenn Colella, Adam Halpin, Mykal Kilgore, Stephen Kunken, Tamika Lawrence, Carrie Manolakos, Ken Marks, Asa Somers, Jason Tam, Brenda Wehle, Natalie Weiss, Tim Young, and Remy Zaken. Understudies were Stephen Christopher Anthony and Noah Kieserman (FB) for Evan, Jared, and Connor; Jane Pfitsch (FB) and Coleen Sexton (FB) for Cynthia and Heidi; Ciara Alyse Harris (FB) and Maria Wirries (FB) for Alana and Zoe, and John Hemphill for Larry. Jane Pfitsch (FB) was Dance Captain. Music was provided by an on-stage band under the direction of, and conducted by, Austin Cook [Keyboards]. Garrett Healey was the Associate Conductor. Other band members were: Matt Sangiovanni and Matt Brown [Guitar]; Ryan McCausland [Drums]; Matt Rubano [Bass]; Jen Choi Fischer [Concertmaster]; Linnea Powell [Viola]; David Mergan [Cello]. Rounding out the music credits: Robert Payne [Local Contractor]; Randy Cohen [Keyboard Programmer]; Jeremy King [Assoc. Keyboard Programmer]; Enrico de Trizio and Scott Wasserman [Abelton Programmers]; Emily Grishman Music Preparation [Music Copying]; Alex Lacamoire [Music Supervision, Orchestrations, and Additional Arrangements]; Ben Cohn [Assoc. Music Supervisor]; Michael Keller and Michael Aarons [Music Coordinators]; Justin Paul [Vocal Arrangements and Additional Arrangements]. Finally, turning to the production and creative team: The combination of David Korins‘ Scenic Design and Peter Nigrini‘s Projection Design worked together to create a modernist set that primarily consisted of moving scrims with projections from internet social media as well as scenes (although the piercing blue of the end scene was remarkable), and little in the way of traditional place-establishing scenery, although there were numerous place establishing props. These worked well Nevin Steinberg‘s sound and Japhy Weideman‘s lighting designs. Emily Rebholz‘s costumes and David Brian Brown‘s hair seemed, well, everyday — which means they did what they were supposed to do, making the characters appear as relatable teens and parents. Other production credits: Tara Rubin Casting [Casting]; Judith Schoenfeld [Production Supervisor]; David Lober [Production Stage Manager]; Michael Krug [Stage Manager]; Sarah Testerman [Asst. Stage Manager]; Juniper Street Productions [Production Supervisor]; Adrienne Campbell-Holt, Sash Bischoff, and Adam Quinn [Assoc. Directors]; Danny Sharron [Asst. Director]; Jonathan Warren and Mark Myars [Assoc Choreographer]; Liz Caplan Vocal Studios LLC [Vocal Consultant]; and Buist Bickley [Production Properties Supervisor]. 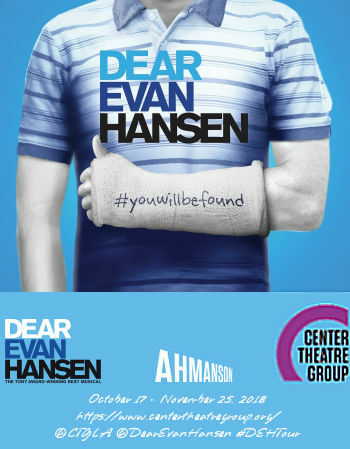 Dear Evan Hansen continues at the Ahmanson Theatre (FB) through November 25, 2018. Tickets are available through the Center Theatre Group website. They do not appear to be available on Goldstar. Note: As always, we seem to hit at least one Broadway Cares / Equity Fights AIDS performance every year. Last night was no exception; the actors were out with their red buckets. We expect to get hit up again tonight at A Bronx Tale. So, we’ll hit you up as well. Donate to BC/EFA here. Tonight continues the theatre with A Bronx Tale at the Hollywood Pantages (FB); Monday we have A Day Out With Thomas at Orange Empire Railway Museum (OERM) (FB). The third weekend of November brings Beyond Jacobs Ladder from Jewish Woman’s Theatre (FB) at our synagogue on Saturday, and Finks at Rogue Machine Theatre (FB) on Sunday. Thanksgiving weekend has Steambath at the Odyssey Theatre Ensemble (FB) on Saturday and Remembering Boyle Heights at Casa 0101 (FB) in Boyle Heights on Sunday. December starts with the Annual Computer Security Applications Conference (ACSAC), followed by a hold for the Canadian Brass at the Saroya [the venue formerly known as the Valley Performing Arts Center (VPAC)] (FB). Then we may travel up to the Bay Area for Tuck Everlasting at TheatreWorks Silicon Valley (FB) (although that is starting to look less likely).